I try to be the healthiest I can be, but I still find myself with cravings and wanting to indulge once in a while. 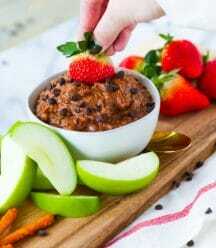 Luckily, I’ve created this craving-satisfying dessert hummus to pair with an assortment of fruit to keep my chocolate fix and my sugar levels in check! It’s filled with protein from chickpeas and it gets its chocolaty sweet flavor from Enjoy Life chocolate chips and pure maple syrup. A couple of months back I noticed that dessert hummus made a huge entrance into the health scene. Some of my friends, who work for massive food corporations, were developing it, bloggers were blogging about it, and everyone and their mothers were trying to recreate it. I’m one of those people! Can you blame me? The concept is pretty brilliant. Take a balanced savory snack and add some sweetness to it! The only issue? A lot of the store bought and blogger recipes include ingredients like coconut oil, white sugar, and some other ingredients I can’t pronounce, let alone understand what they are. No thank you. Instead of missing out, I decided to make a healthier version and it turned out great! You won’t find a drop of oil in this chocolate dessert hummus, so dig in! Coconut oil has been touted as a health food over the past several years. As far as I’m concerned, all oil is unhealthy. It’s essentially 100% fat that’s been stripped of all of the original food’s nutrients. For example, olive oil is made from olives. Olives are a good source of copper, iron and fiber. They have antioxidants and can help decrease blood pressure and have anti-inflammatory nutrients. But here’s the thing, when you process olives into oil, you lose all of those nutritional benefits and end up with pure fat. Coconut oil is even worse. Coconut oil is also 100% fat, and unlike olive and other vegetable oils, which are unsaturated fats, coconut oil is saturated. Saturated fats have been proven to raise cholesterol. High cholesterol is known to increase the risk of heart disease and stroke. Foods that contain saturated fats are all animal products and coconut and palm oil. If I can avoid foods with saturated fats, you better believe that I will. A couple of weeks ago I decided to completely forgo all oil, including unsaturated olive oil. Why you ask? It turns out that oil may impair endothelial function and have adverse effects on cardiovascular health. Being an avid runner and certified personal trainer, as well as having a Master’s degree in health psychology, I’m always concerned with heart function, so I decided to give it up rather than take any risks. It’s been really easy to do overall, but it definitely forces me to be creative once in a while. For example, when I found myself craving dessert hummus and looked at a container of store bought chocolate hummus, I was shocked by the amount of fat and calories. Then I looked online and saw a bunch of oil-laden recipes, which weren’t an option, so I knew that I needed to make my own! 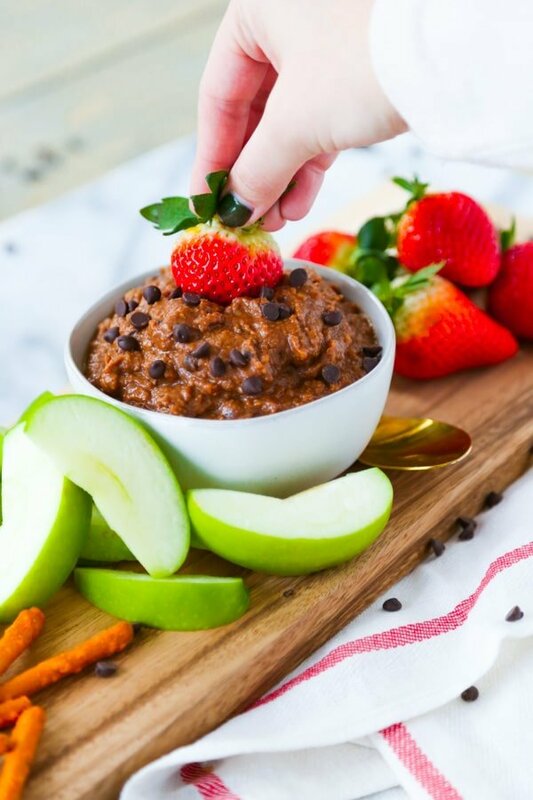 Enter our incredible double chocolate brownie batter hummus. 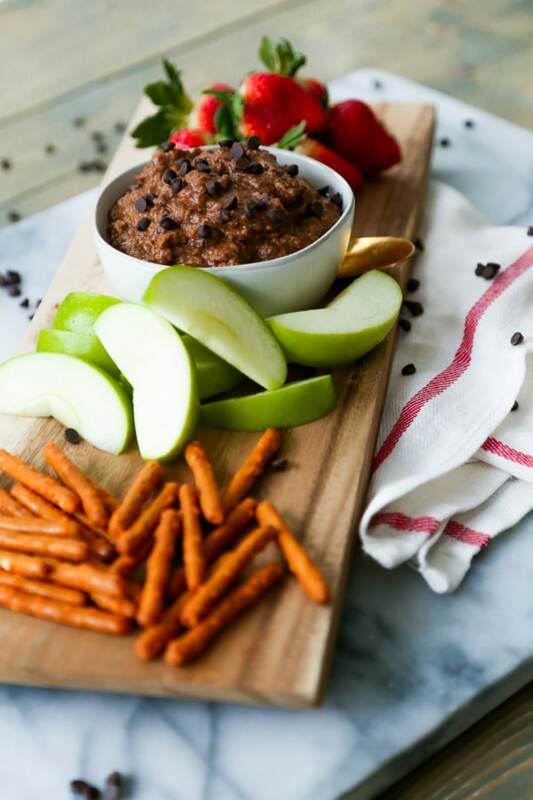 This creamy sweet dip is so full of chocolate and is perfect with tart green apples, sweet and juicy strawberries or salty pretzel sticks. It’s also filling, so a little goes a long way. I ate a few bites of it and I was perfectly satisfied. This would make a great dessert for a party because one batch can feed several people. 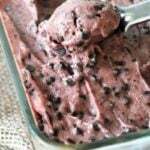 Looking for other oil-free dessert recipes? 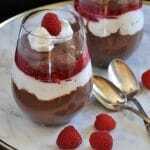 Check out our amazing chocolate raspberry pudding parfait or our cherry chocolate chip nice-cream ! 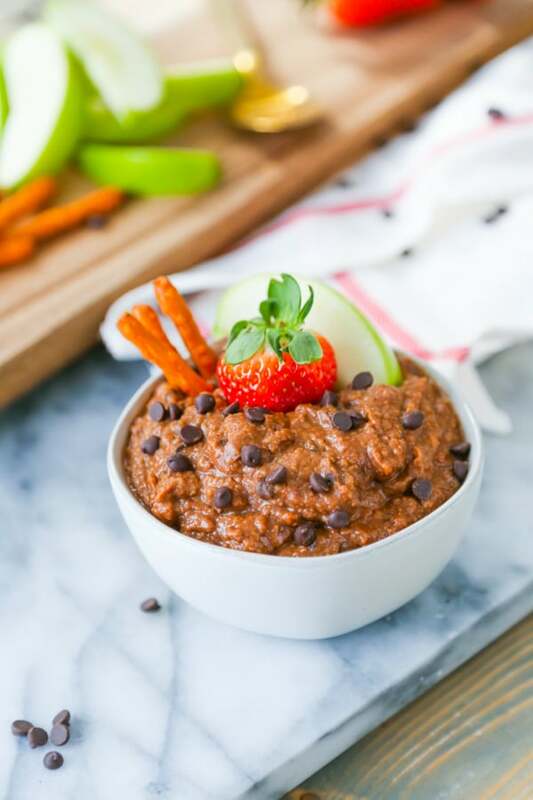 Make our delicious chocolate dessert hummus and let us know what you think. Don’t forget to take a picture and tag us @veganosity on Instagram so we can see your gorgeous creation. Creamy and chocolaty hummus that tastes like brownie batter. Filled with protein and healthy ingredients! So easy to make! Drain and rinse the chickpeas and place in a food processor or high-powered blender along with the maple syrup, melted chocolate chips, vanilla and sea salt. Blend until smooth and creamy, approximately 2 to 3 minutes. A couple of months ago I left all of my favorite vegan bloggers and started following new WFPB bloggers for the reason you mentioned. I’m trying to get healthier by kicking oils and sugars out of my diet. You were one of my favorites and I’m just soooooo happy your blog has been going in the direction of WFPB. I’ll always be vegan for the animals but I also want to be healthier for me 😬 Trying your recipe out this weekend! Looks delish!! Hi Trish! Thank you for your honest comment and kind words about our blog, we really appreciate it! 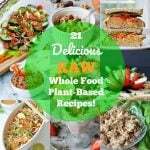 We started Veganosity so that we could share our favorite traditional recipes that we veganized, and we've had great success. Starting in late summer, we're going to be changing our focus to 100% clean whole food recipes. Alex and I are committed to a healthy lifestyle and realized that between the knowledge that we both share, we can help people change their lives for the better, both physically and mentally (because we know how difficult change and eating right can be). We've done a great job creating recipes for the masses, and for those who are looking for recipes that are similar to their favorite meat centric dishes. Now it's time for a different approach, and we're so excited. I hope you stick with us, because we have some exciting things in the works for our readers. Thank you, Joan! It's so good, and it's so rich that just a few bites is satisfying. 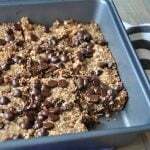 This looks so good Linda, always a good idea for Chocolate that also healthier! Awesome to hear about the oil-free! I've been oil-free and baking oil-free for 6+ years now and I can't imagine any other way and the best part is that everything tastes JUST as good. It's just learning how to be more creative and going against the grain than the norm and all my desserts get devoured by non-vegans that are always shocked there is no butter or oil, haha! Thank you, Brandi! It's definitely a healthier way to cook, and food does taste fresher without oil. My husband is having a hard time not putting oil in the food he cooks, mostly because he believes it adds flavor. I'm teaching him that vegetable broth can do the same thing. It will be like converting him to eating 100% vegan, slow and steady wins the race. LOL! It looks tasty. 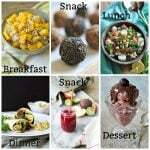 Linda, I also prefer healthy lifestyle, but sometimes can't stop my cravings. It looks like a perfect dessert for me. 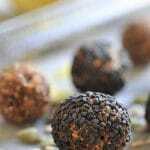 Great recipe and love that it's oil free, thanks! I've gotten away from using it at home to balance eating out and want to get closer to a whole foods plant based diet. We're so glad you like it! We're making some big changes to the blog this summer and our recipes will be exclusively whole food plant-based. Stay tuned! Is the nutrition facts for the entire 2 cups? Yes, it's for the entire recipe.